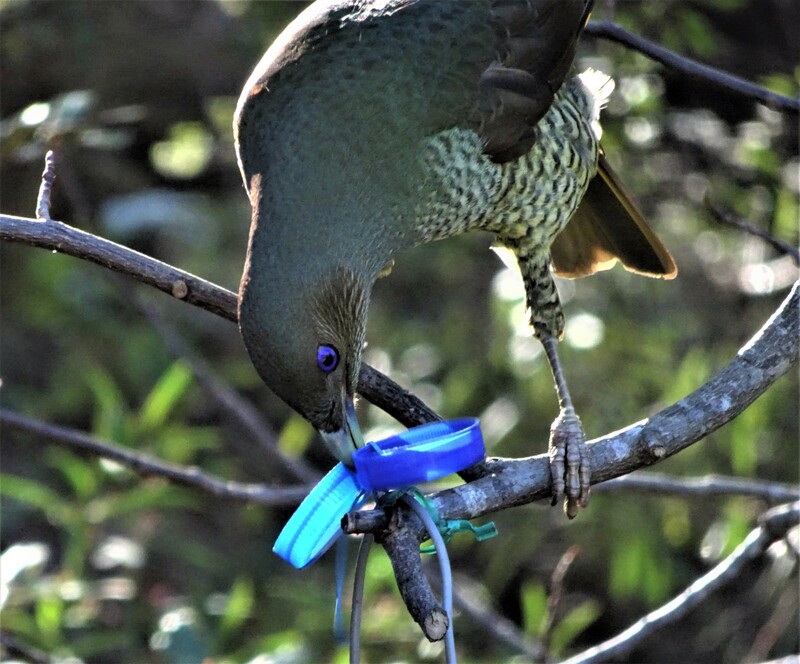 The secret life of the satin bowerbird. 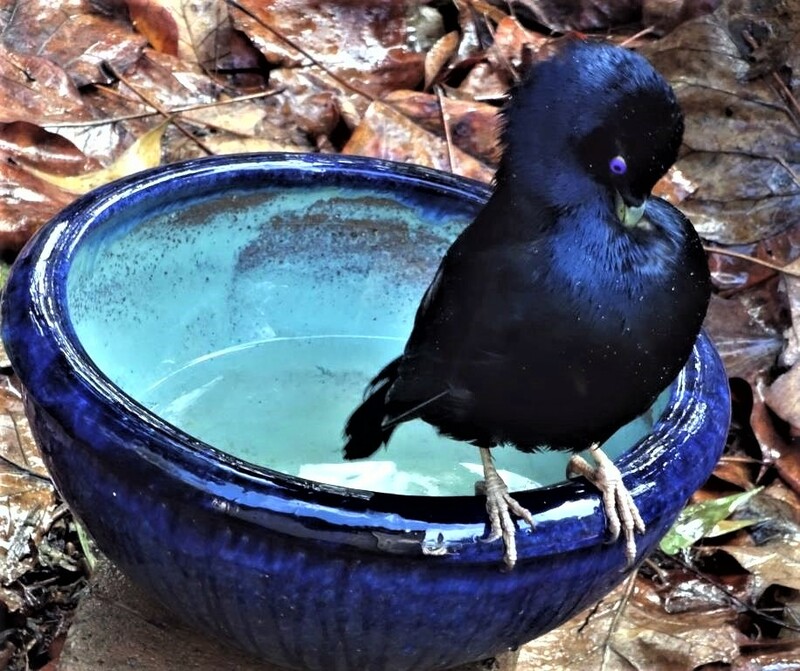 Perhaps the most entertaining and interesting birds in my garden are the Australian Satin Bowerbirds. The difference in appearance between females and juveniles and the adult male is hard to believe. Initially the birds are olive green, with cream and brown scalloped chests, bronze wings and tail. They have piercing blue, Liz Taylor eyes and dark beaks. As the males approach maturity around five years of age they begin a slow transformation. It can be two years before the change is complete; to glossy blue-black plumage, pale beak and violet eyes. Here is a bird in transition. And a short time later. His eye is already violet. It’s no surprise that the male in particular prefers my blue bowl. The indigenous Wiradguri people know the birds as ngurum-bula, meaning ‘two homes’ – a bower of sticks built by the adult male and a separate nest (a marrung) for the female’s eggs My thanks to Adam Gowen for this information. The nest is also built of sticks, and located in a nearby tree. There are usually two eggs, which are cream, speckled with brown. Am I a cute chick or wot?? 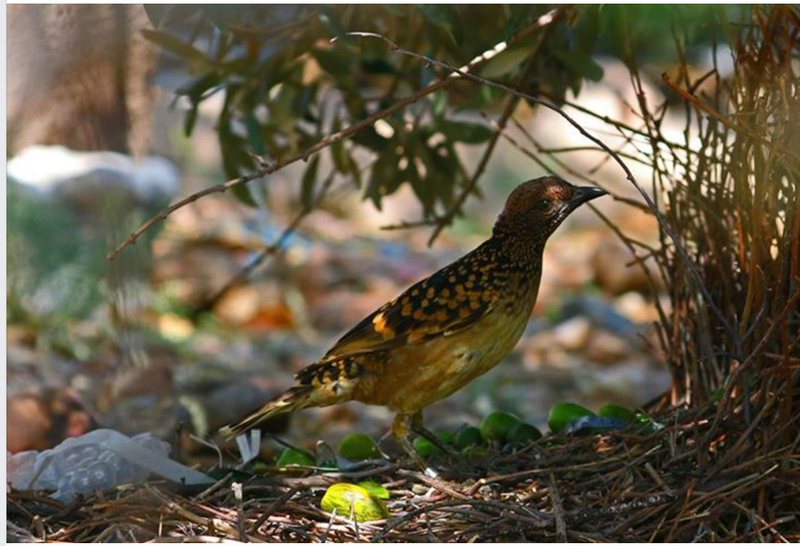 Now a male bowerbird has two great passions. One is eating (especially fruit and veg) and the other is collecting treasures to decorate their female attracting bowers. 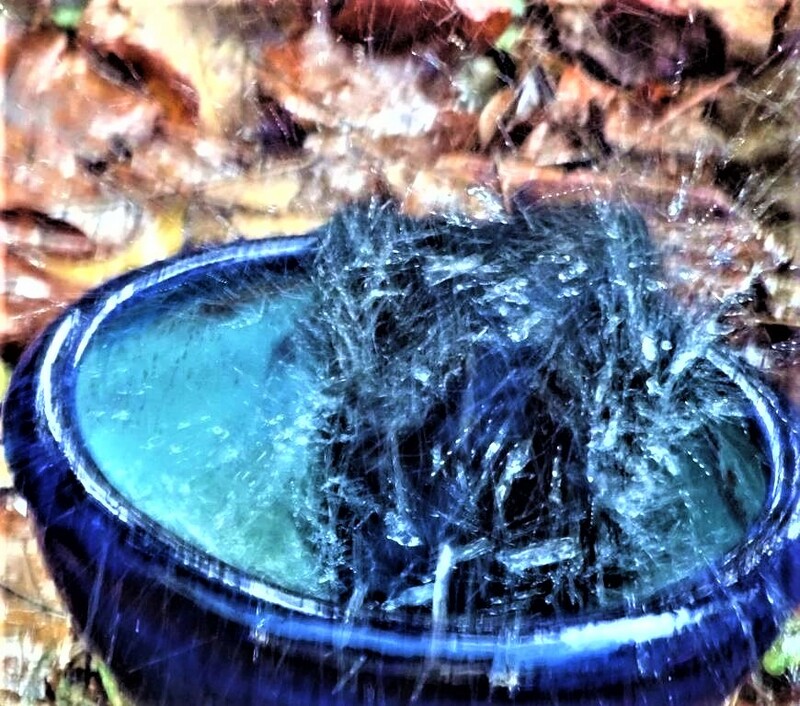 The male decorates its bower with anything blue it can find. Here in the Blue Mountains it uses blue wildflowers such as Patersonia, and the blooms and berries of Dianella. Exotic blue flowers are a real bonus. In my garden their favourite is the groundcover Lithodora, which has tiny, star like flowers striped blue and white. I have to admire their choice, as they are beautiful and delicate enough to decorate wedding cakes. Just as well I have plenty. Oh, these may be a winner with the ladies! Dianella berries to match the bowerbird’s eye. Tail feathers from the gorgeous blue and red crimson rosellas are also prized. The crimson rosella’s tail feathers are prized by bowerbirds. What else? When you think about it, there is not a great deal in nature that is blue. These days the adaptive birds steal blue plastic drinking straws, clothes pegs…and above all, milk bottle tops. I sometimes tie a couple to a chair with cotton thread….simply for the delight in seeing them try to detach them. . But let’s face it, all this plastic is not good for the environment. Oh yes, I’m a bowerbird of impossible beauty! That fan might be useful on a hot day. Photo by kind permission of Ian Joass. They also pilfer treasures from each others’ bowers. What a show! Surely stolen property. It is interesting to compare these objects with those found in bowers in times gone by. In the early days of white settlement the birds took a liking to bonnet ribbons, pieces of broken, willow pattern china, shards of glass from blue perfume and medicine bottles, and (later) the marble stoppers from early carbonated drinks. Carbonated drink bottle with its marble stopper. Eight bluebags (once used in laundries to keep linen white) , 10 pieces of blue matchboxes, one blue cigarette packet, (thankfully not so much smoking these days!) one piece of blue string, 34 pieces of blue glass, 17 blue feathers, blue marbles, (from a childhood pastime since replaced by computer games) one car park ticket, four blue chocolate wrappers, and a blue invitation card to an ‘At Home’ (oh the etiquette of the 1940’s) . What a perfect snapshot of life 70 years ago. Not a piece of plastic in the list. Interestingly, we may be turning full circle. My Blue Mountains village of Blackheath recently claimed to have become the world’s first community to ban plastic straws. A straw floor…a great pic by Graeme Chapman. I suspect the bird in the above photo lived next door to a milk bar. He may have to make a radical change in his collecting routine soon, especially if he lives anywhere near Blackheath. Bowerbirds like to hide their bowers away from prying eyes, but they are quite easy to locate due to the bizarre noises they make. It can only be described as a mixture of chirring, whirring, buzzing and whistling. By the way, there are other varieties of bowerbird. Below is an adult Western Bowerbird, whose addiction if for all things green. Dorothy Latimer wondered where all her unripe tomatoes had gone. UPDATE – August 2018 Not a plastic straw in sight. Next step, ban plastic milk bottles. A master craftsman at work. Wow, so many bottle tops. I would like to include a link here to a bowerbird’s blog Many thanks Dennis. For another story about our wonderful birds, click HERE. A 'POX ' ON DEMENTIA! TAKE A JUMP! - AUSSIE WOOD DUCKS. 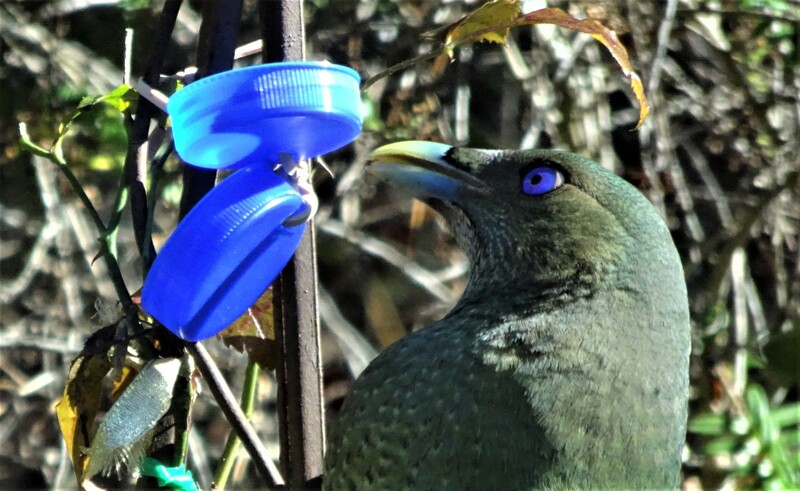 Enjoyed your pictures and the write up — thanks for telling us about the blue-eyed Satin Bowerbird. Glad you enjoyed it, Sudha. They certainly keep me entertained! That is so interesting! The most interesting birds we get in my neighborhood are the family of crows and the local parrots. I couldn’t tell you much about the parrots, they’re more heard than seen. But the crows are fun. When I had rabbits, they liked to play games with each other. The crows would also become protective when the neighbor’s cat came into the yard. If it went anywhere near their bunny friend, they would dive-bomb it and chase it out of the yard. My rabbits were always safe outside when the crows were around! Crows are one of the most intelligent birds of all, Christina. If they are pinching fruit from an orchard they always appoint a ‘lookout’. And generous of spirit too! Beautiful looking and very interesting sounding bird. Don’t think I ever saw one on any of my visits to Australia. They are in the bad books now, Marcia…for eating the leaves of Editor Des’s green beans! Thanks for such a lovely page, Pauline. 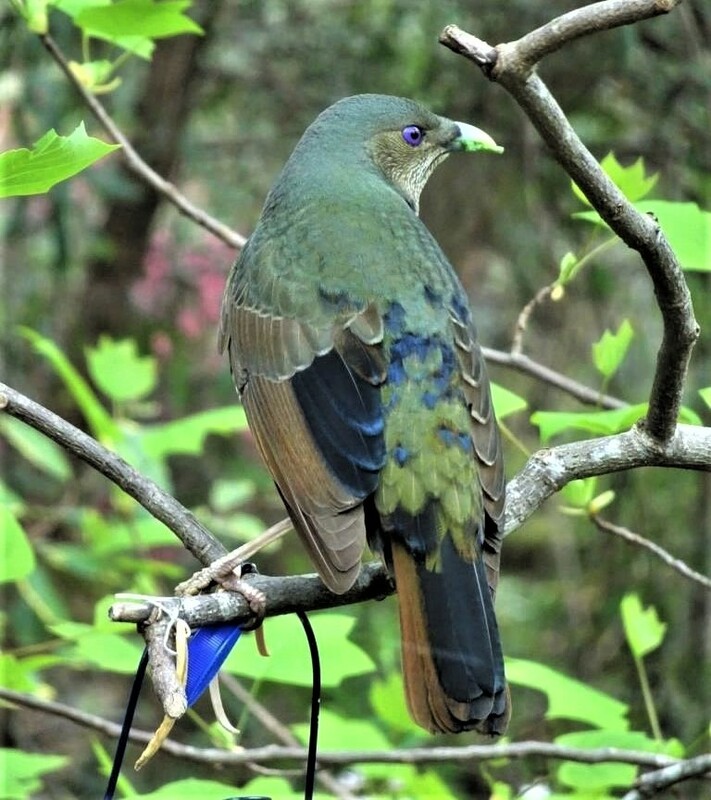 This month a bower has suddenly been set up outside our window and the Satin Bowerbird is blogging furiously. Most research and movies focus on springtime. This of course is autumn where we live in southeastern Australia. There is a complex of interaction between birds in the blog. I don’t know how long this bird and this bower will remain, but there is a chance to observe long term relationships and roles. Hi Dennis, thanks so much. I will be following your bowerbírd’s blog with great interest. I will add your link to the article. Maybe you can link yours back to this page too. Our bowerbirds have just reappeared after an absence of a few weeks. No problem, Pauline. I forgot to mention that I already have you in the middle of research links, right column. Will you be writing more on this subject? I have subscribed to your blog and will weave into my blog reference to your stuff in some story. But for the moment, worse than having fiction characters yelling at me in the night, the birds write the story! Interesting that your birds went away and came back… ours departed for some weeks before this too. Never a bower before, but flashing wings, no strawberries for us to pick and daily contests for figs. 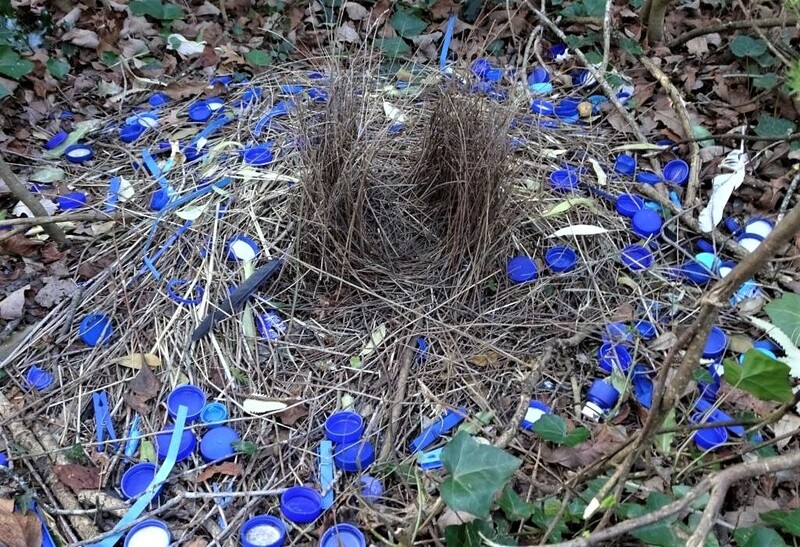 I’ve never found a bowerbird nest. In front of this bower is a huge old Port Wine Magnolia much higher than the house. It is home to birds of many species, I think. They’ve chosen a somewhat secret place and I leave that to them. 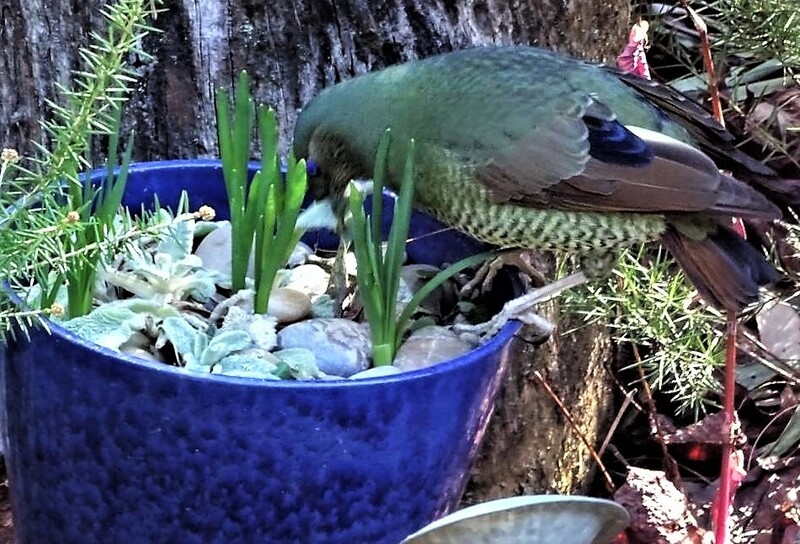 It’s very satisfying, also in the context of some neighbours grumpy about our filling the front yard with food and other plants, that our suburban forest definitely pleases the bowerbird. Pleased you have the birds in social context. Helen’s first qualification in social work, mine in anthropology (in 1963!) so we are attuned to social networks and keen to discover what this bird’s life is, without anthropomorphising. I’ve never had a bower in my garden either. I think it’s the least they could do after all the tomatoes and raspberries they eat! I write about all manner of things on this site, so no doubt I will revisit the bowerbirds. I love social history in the broadest sense. I even started a Facebook Page on Australian Social History which has grown much larger than I anticipated. No wonder I don’t get much ‘proper’ work done. Am supposed to be writing the biography of a controversial Tasmanian surgeon (Dr Victor Ratten), but the birds here constantly lure me away from my desk. I will be after Ian Rowley’s book now. I remember reading about them once before and how they collect anything blue they can find to add to their nests. How lucky to have such wonderful birds visiting your garden. Pauline contacted me in facebook with the information after we photographed a juvenile in the forest at North Haven. The transformation of this bird is amazing. 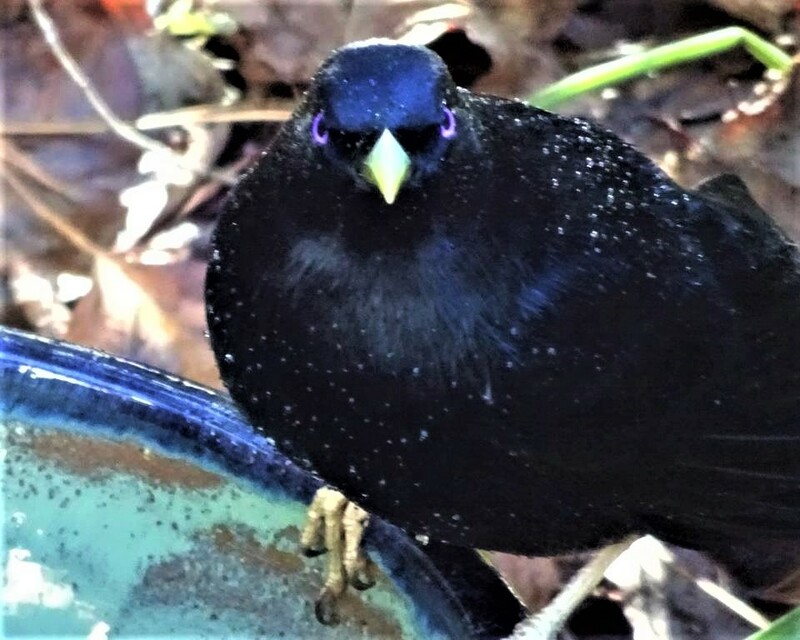 Thanks Pauline for this blog post and helping my daughter and I to know more about this amazing bird. Just Awesome, to say the least. Thanks Marty. So pleased Karin is interested in our wonderful birdlife. Awesome work Blue Mountains village of Blackheath! I wonder if I could trouble you for some help/tips on how to get rid of (blue) plastic lids from milk & juice bottles?? ?